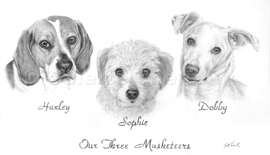 Pencil portrait of three dogs. Click to enlarge. 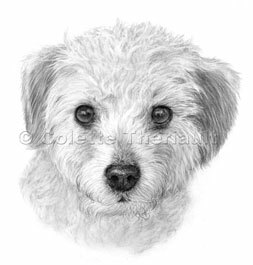 Size: 12" x 22"
Breed: Beagle, Terrier Poodle mix & Jack Russell Terrier mix. Group Portrait of "Our Three Musketeers". Since the pencil lines are very pale when I draw the sketch, I use special software to enhance the lines. 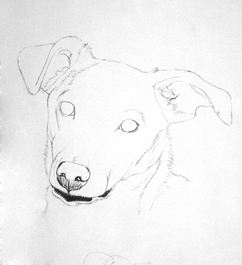 This is the first dog of the group. I usually need to modify the reflection and highlight in the eyes. The reflection from the camera is not always suitable. 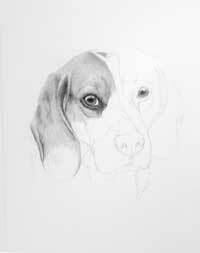 This beagle's fur is so fine and short that the actual pencil strokes are mere millimeters long. 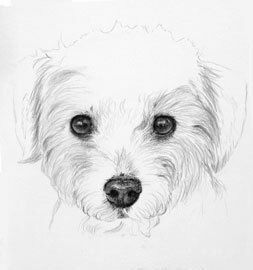 I continue to add layers of hair to darken the fur. Huxleys' markings are gradually appearing. 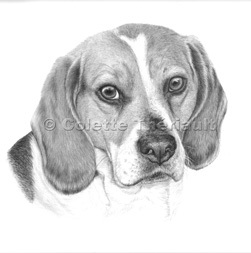 The muzzle and neck area are completed in this step. 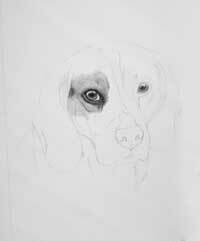 I work on the second eye as I continue to work my way to the left of the canvas. 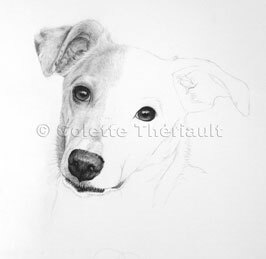 In this last step, I work to complete the top of the dog's left eye as well as the cheek and left ear. The second dog in the group portrait has very different fur than the other dogs. She is very "scruffy" in appearance. The facial fur is mostly complete on this step. 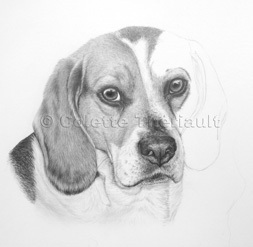 Next I continue to work the details to the ears, chin and neck area. The neckline was adjusted in this step, as well as the chin and ears. Click image to enlarge. 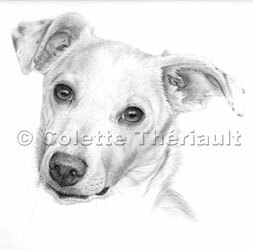 Last but not least is the third dog in this group portrait. 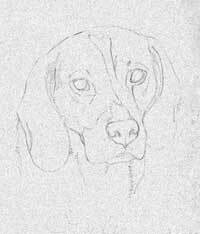 This is the outline sketch. To prevent smudging, I draw left to right. 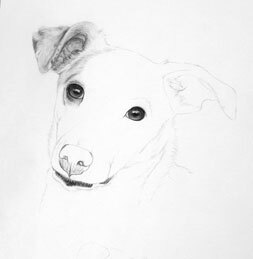 Here I start with Dobby's right ear. 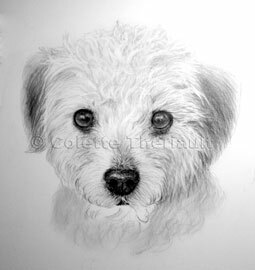 The left side is almost complete as I continue to add the short white fur of the face. Almost done! 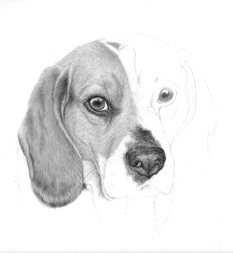 The dog's neck area is the last area I draw the fur. 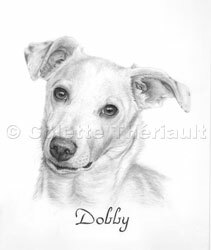 Dobby's portrait is complete. 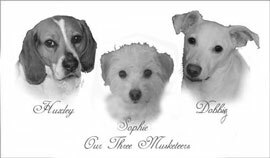 Scroll above page to view the group portrait of all three dogs.